Castings | Arvalda Corp | Florida Metal Casting Services | Metal Casting Technology Services | Sand | Die | Investment | Permanent MoldArvalda Corp.
We find metal castings fascinating because there are often opportunities to save cost by moving to a different metal casting technology than perhaps a client had originally envisioned. On the buttons to your left you will find information about some of the casting processes we get involved with. 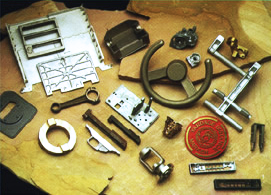 Below you will find mechanical properties of some of the most commonly specified casting alloys. The information above is believed to be accurate but is in no way warranted. These are but a few of the alloys we get involved with. Please get in touch with us so we may get your casting project started on solid footing. This question often comes up when considering casting a part vs. machining. The following information is presented for reference. Casting A process used to form solid metal shapes out of molten metal. The molten metal is poured into a cavity or a mold. Charge Metal and alloy materials that make up the composition of a melt. Checking Fine cracks on the surface of a die which produce corresponding raised veins on die castings. Checking is caused by repeated heating of the die surface by injected molten alloys. Draft Taper on the vertical sides of a pattern or corebox that permits the core or pattern to be removed. Ductile iron A cast iron that has been treated while molten with an element such as magnesium or cerium to induce the formation of free graphite as nodules or spherulites. This imparts a measurable degree ductility to the cast metal as opposed to grey iron which is more brittle. Ejector marks Marks left on castings by ejector pins. Ferrous Metal An alloy that has iron as the predominant metal. Flash A thin section of metal formed at the mold, core, die joint or parting in a casting. Flash usually forms when the cope and drag do not match completely or when the core and the coreprint do not match. Gas Porosity A condition in a casting that occurs when gas is trapped in molten metal or as a result of mold gasses that evolved when the casting was poured. Gating Systems The channel(s) that allow the molten metal to enter the mold cavity. Green Sand Moist sand that is bonded by a mixture that contains silica, clay, carbonaceous material, and water. Gross Weight of Casting The weight of the casting which includes the actual product plus the metal in the gating system as poured. Impurity An element that is allowed into a metal or alloy. Impurities slightly change the properties of the material in some circumstances and can completely damage it in others. Investment Casting A casting process that uses a wax or thermoplastic pattern and is surrounded in a refractory slurry to form a mold. Once the refractory slurry is dry, the wax or plastic is melted out and the mold is formed. Molten metal is then poured in to fill the area that was previously filled with wax. Jobbing Foundry A foundry that creates a wide variety of castings, in small quantities for a range of customers. Ladle The name for a variety of receptacles used to move and pour molten metal during the casting process. Loose Pattern The cheapest pattern to make, has the shape of the casting without forms for sprues, risers, etc. attached. Master pattern The object from which a die or production pattern can be made; generally a metal model of the part to be cast with process shrinkage added. Metal Yield The difference between the weight of a finished casting and the total weight of the metal poured. Mold The cavity that the molten metal is poured in to form the final shape. A mold usually consists of a top and bottom piece made of sand or ceramic material. Mounted Pattern A pattern that is fastened permanently to a board or match plate. Net Weight of Casting The final weight of a casting that is determined once all of the excess metal from the gating system has been removed. Non-ferrous Metal An alloy that doesn’t have iron as the predominant metal. Pattern Draft The taper allowed on the vertical faces of a pattern to enable removal of the mold or die. Rapid Prototyping The computerized equipment that builds a three-dimensional model of a casting from a CAD drawing. Sand Casting Producing metal castings out of sand molds. Sand Reclamation Processing used sand grains into usable forms so that they can be used in the casting process as a replacement for new sand. Scrap All non-product metal produced during the casting process.